Baby Boomers Lower Their Taxes, And Look To Pass the Buck? 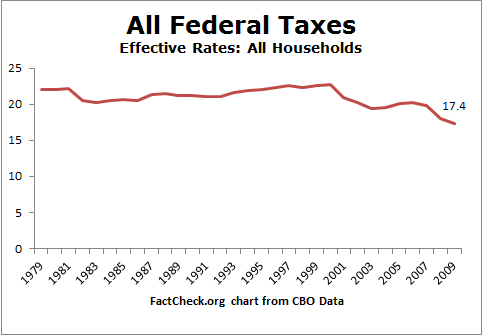 Here’s a chart showing declining tax rates in the United States. This chart got me thinking about democracy and generational conflict in America, specifically as it pertains to public debt. It seems that the Baby Boomers are trying to coax the Millennials into their camp by offering them help with student-loan debt. The problem is that always and everywhere when property rights aren’t equally protected, the politically vulnerable are the ones that suffer. So, in a democracy, who are the politically vulnerable? Those not in the majority. Who is the majority in the USA circa 2013? The Baby Boomers. So, who is going to benefit from the weak property rights? Baby Boomers. Who is going to suffer? Everyone else. So, the Millennial are not part of the Baby boomers and thus have a giant target on their back. But, they are a fairly large cohort so they represent a threat to the Baby Boomers. So, the BBs effectively tell the Millennials, “Join our gang and we will loot ‘The Other Guys'” The problem is that “The Other Guys” are people not in BB (including the Millennials). So, the BBs set up a smoke screen and claim that all the money that they demand is going to come from “The Rich”. Ri-i-i-ght. We’ve seen the tax rates drop like a rock for BBs while they have been in their peak earning years (see the chart above!) including for the rich Boomers. The money is going to come from the Millennials. So, the Baby Boomers are bribing the Millennials with their own money and they seem to be taking the bait. The BBs are going to coax the Millennials into the “no property rights allowed” camp and then once the locks are broken on the safes, turn around and loot them. Brilliant. It’s not “The Rich” that get looted when property rights get destroyed. In every regime it’s the politically weak – or in a democracy, those not in the majority.